Water is the universal solvent and necessary for life. Impurities in water can be harmful to public health and can interfere with the smooth operation of industrial equipment and processes. We treat water professionally. Backed by nearly 100 years of experience with field proven technology and equipment, Refinite strives to ensure that water related problems do not tarnish the reputation of our customers. "Stain-Less" is our goal -- Pure water is our solution. This site presents examples of the types of equipment offered by Refinite Water. Since every product is built to the customer's pre-engineered specifications, Refinite furnishes only components that meet your requirements. 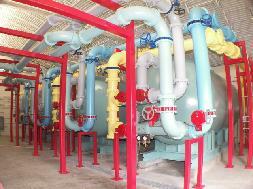 Refinite offers a wide variety of municipal and industrial water treatment products. These factory-built components are built by leading equipment manufacturers in the industry and backed by years of experience. Refinite Water strives to offer products that are simple to operate, efficient in removing contaminants and impurities, that will not corrode or rust and that will reduce chemical usage and waste volume. Please take this opportunity to explore all that Refinite has to offer. Contact us anytime, to request specific information like budget estimates, quotations, typical equipment drawings and specifications, on-site pilot testing equipment. Opportunities exist for independent sales representatives in many regions throughout the United States. Feel free to contact us with your capabilities and marketing goals.